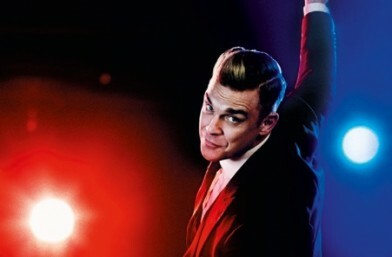 Robbie Williams’ spectacular “Swings Both Ways Live” tour is set to open on April 25th in Budapest. The tour will feature songs from both of his number one swing albums, “Swing When You’re Winning” and last years huge No 1 album , “Swings Both Ways” – as well as some classic Robbie career favourites. Last year saw Robbie perform a one off swing show at The Palladium featuring several special guests, including Robbie’s dad – Pete Conway. Pete will join Robbie once again on this tour, performing at one point in the show with his son. Robbie will be dressed by Saville Row tailor Spencer Hart and joined by a classic big band and eight dancers. Robbie and long time collaborator and show producer, Lee Lodge, have added the talents of West End choreographer and performer Alistair David (Fosse, The Sound of Music, Tonight’s The Night, Sinatra at the London Palladium) to ensure the show is an all singing all dancing extravaganza.